Monte D. Fitts, Realtors is the operator of The Whaler Vacation Rental Program. Serving West Maui for over 30 years, Monte D. Fitts, Realtors has established lasting relationships with Whaler guests and owners allowing us to offer the finest units at rates well below our competitors. We are located a few miles up the road in The Kahana Professional Building, 10 Hoohui Rd. #204, Lahaina, HI 96761. This location enables us to provide personal attention to our clients. We frequently inspect the units ourselves to assure they are well maintained and many of our guests return year-after-year satisfied with the level of service we provide. Cleaning: Staff will schedule and monitor cleaning services through the vendor. Property Management: We frequently inspect the units to ensure they are properly maintained and oversee routine repairs and maintenance. Guest Screening: Some owners have special requirements for their units such as maximum occupancy or other requests. Unlike online booking agents, we speak to each potential guest and are able to carefully screen guests to fit within your criteria. Booking Referral: Lower commission fee to Agent if owner provides a booking referral. Monte D. Fitts, Realtors works continuously to market our program to potential guests. We offer the ability to be marketed on popular booking sites, without having the responsibility of monitoring and maintaining the listings yourself. 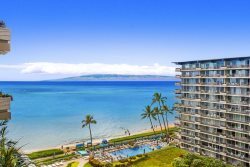 Our rental program has been a part of The Whaler on Kaanapali Beach for over 30 years and in that time have built long lasting relationships with guest that return year after year. LiveRez Reservation System: We have a long-standing partnership with LiveRez, our reservation system company. They are a leading company for vacation rental operating systems. They continuously work to keep our website and system up to date with the ever-changing trends of booking a vacation rental and provide access to the newest advances in technology and training for vacation rental companies. Vacation Rental Website: Our staff has recently finished a beautiful new website to present new units to our program (www.thewhaler.com) with advances in technology to keep up with the trends of searching and booking on mobile devices. This will showcase your unit to website visitors and highlight the quality of units in our program. Additional Booking Avenues: We have our listings taking advantage of all listing sites that cater to vacation rental condos such as VRBO, Flipkey (Trip Advisor partner) and AirBnB. We personally manage each listing to ensure we stay competitive with other listings and keep the personal interaction with each guest. Social Media: With the completion of our NEW website, our staff has been working diligently on growing our social media presence as that has become a very important tool for any business. Our staff has been a part of the Monte Fitts team for many years and are personally invested in the level of service we offer. Our team makes it a top priority to provide a personal connection and service to owners and guest alike. We work with a company that is very professional and detail oriented. Their staff is diligent in reporting any maintenance issues or cleaning follow up that is needed such as carpet cleaning or dry cleaning of bedding. They offer a wonderful interactive scheduling system that we us to stay in contact and provide any special details that may be needed. Before every check in the head housekeeper does a final inspection to insure everything is in order prior to guest arrival. These inspections are in addition to the inspections and inventory our staff does as well. Housekeeping service include starter supplies in the kitchen and bathrooms of things like dish soap and trash bags. We schedule a “mid clean” for guest staying 14 nights or longer. If a guest should require additional services they can be arranged at an additional cost to the guest. Owners are paid monthly for the previous months rental income. A detailed statement along with any invoices will be provided by the 10th of each month as well as a deposit of funds to the account of your choice. Our office is located a few minutes north of The Whaler to provide prompt attention to any guest issue that would require us to be on property. Monte Fitts, principal broker, is a resident of The Whaler and has owned property there off and on for the last 30 years. Because Monte lives on property this allows us to be able to attend to anything that would require immediate assistance. We coordinate and schedule all necessary maintenance as well as coordinate delivery or purchase of items needed for the unit. Our staff is available to guest 7 days a week. We work diligently over the weekend as well to follow up on any inquiries received. Agent maintains all booking and advertising venues making sure all photos, guest information, rates and calendars are up to date.